Designed in a semi circle, interlocking with the partition walls, the reception counter is an embodiment of the vesica pisces geometry. The marble front is constructed with Labradorite which incorporates semi-precious stone and fossilised nautilus shells, strategically lit to enhance the lustre of this captivating material. A semi-precious stone of protection, Labradorite raises consciousness and connects you with universal energies. It works to deflect unwanted energies from your aura and prevent any energy leakage from occurring. It forms a barrier against negative energies and aligns the physical and etheric bodies. Labradorite is also a stone of esoteric knowledge, it stimulates intuition and grounds the spiritual body into the physical. Labradorite works to calm an overactive mind yet energises the imagination; stimulating new ideas. It is a useful stone for support while going through a period of change as it is known as a stone of transformation. The marble front is constructed with Labradorite which incorporates semi-precious stone and fossilised nautilus shells. The water feature incorporates Labradorite marble enclosed in a stunning amethyst cave-style of design. The eternal flame is the inspiration behind the overarching vase-like shape. Its purpose is to cleanse and purify the surrounding space. 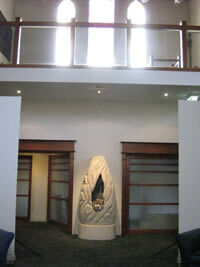 The water feature at the entry to the lower meditation room is opposite the Nautilus spiral glass window. It mimics an amethyst cave, the cradle of the soul, a place which nurtures, cleanses and purifies. It was decided to incorporate a water feature with cyclic water flowing upwards and downwards as this is symbolic of the connection between Heaven (water flowing upwards) and Earth (water flowing downwards). Carved from Gambier Stone, a lightweight fossiliferous Limestone from South East South Australia. This was specifically selected as the medium for the sculpture for its properties of enhancing the living qualities of water as limestone allows the life force within water to live and breath. Enhancing the living qualities of water as limestone allows the life force within water to live and breath. The glass windows are a special part of the existing site architecture and an important way to infiltrate the symbology of the sacred geometry secrets behind the design for the healing centre. Some of the key symbology and sacred geometry impressed in the designs include the following symbols: nautilus shell, spiral, torus donut, flower of life and vesica pisces. In order for symbols to work, they need to register in our minds, which then trigger a memory of the particular universal form. Each geometry symbol has been chosen as a memory trigger of our innate health and well being, and for being part of a larger natural cosmos. Symbols: nautilus shell, spiral, torus donut, flower of life and vesica pisces. 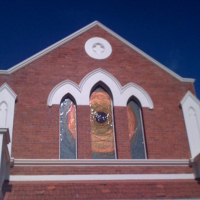 The triple rose glass windows in the upper meditation area is a triptych style art design which overlaps the rose symbols across the three windows. 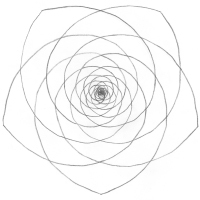 When one looks at a rose, it is easy to see the spiral geometry. A spiral symbol is the mirror of the geometrical shape to which it resonates. Archetypal symbols such as sacred geometry’s are designed to reach through themselves to the natural law, or organising principle, held within their structure. The colours of the rose were chosen to reflect the full spectrum of healing light in which each person who walks into the Centre is naturally bathed. Archetypal symbols such as sacred geometry’s are designed to reach through themselves to the natural law, or organising principle, held within their structure. The windows at the east and west of the front part of the building have a duality about them – a mirroring of symbols, of night and day, of masculine and feminine. The west overlapping circles of the vesica pisces are slightly downward angled indicating the feminine and the opposite is that of the east where the interlocking circles are slightly upward invoking the masculine. 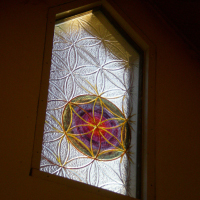 The overarching symbol for these windows is the flower of life geometry. The window above the reception is a simpler in complexity design which, to some degree, acts to link the two parts of the building together. 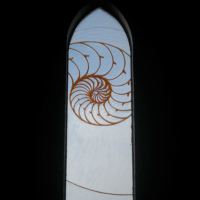 The seminal geometry that is used in this window is that of the nautilus shell and spiral , otherwise known as the Golden Mean spiral. The spiral is the shape of the fluid energy evolving order from chaos. Opening and closing spirals constitute the basic structure of our Universe! One electro-magnetic spiral is moving away from the centre and one gravitational spiral is moving toward the centre, creating a mirror effect of a Universal symbol (similar to that of a star cluster). The shell of the chambered nautilus is a symbol of beauty and proportional perfection. 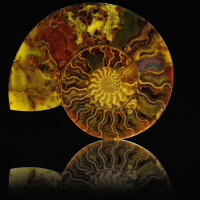 The proportion of this nautilus shell is consistent through it’s symmetrical relationship within the shell – once you discover the ‘secret ratio’, you will see clearly why this particular gem of nature is such a treasure. 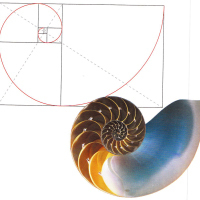 The nautilus shell spiral is a logarithmic spiral similar to other spirals such as the Golden Mean or phi spiral, but with slightly different proportions. A close approximation of a Golden Mean spiral, based on the Fibonacci whole number sequence is illustrated below. The spiral of the chambered nautilus as well as other logarithmic spirals can be found throughout the human body and nature. This inspiring and energetic form is common throughout nature. You can easily find this form in the plant and animal kingdoms and in cloud patterns and whirlpools alike. The nautilus shell and spiral has been used as in the creation of the logo for the centre. The golden mean spiral has been incorporated throughout the interior design, spatial layout, space planning, carpet design and cabinetry. 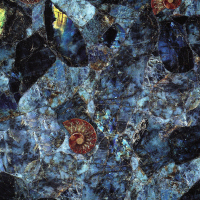 The spiral is featured in the semi-precious labradorite marble at the reception counter, in the fossil piece above the reception desk and in the water feature. The essence of the Fibonacci Principle or use of Fibonacci sequences is to ensure each and every proportion is in a comfortable ratio. What appears to be a piece of furniture is actually a mathematically ordered sequence, much like a sunflower or a shell – they are nature’s perfectly ordered sequence. Standard heights, widths and depths of furniture, shelving, general ‘objects’ have been known and used for hundreds, if not, thousands of years. For example, table heights for eating/working are 750cm. This has been worked out according to ergonomics; the study of human proportions and finding a comfortable height to sit, for most human beings (there will always be the exceptions, extra ordinary tall or shorter people sometimes need custom made heights to accommodate their proportions) but as a general rule of thumb, ergonomics capture the majority. 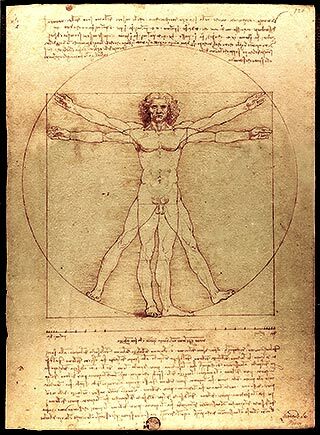 What are human beings natural proportions based on? The Fibonacci … remember Leonardo’s famous sketch? The geometric relationships and archetypal shapes and patterns that occur and reoccur through out the physical universe are deeply rooted in nature. The ratio of adjacent numbers in the sequence progressively approaches the golden mean proportions of 1:1.618. The shell of the chambered nautilus is a symbol of beauty and proportional perfection. The carpets throughout the health centre are lush and beautifully patterned, replicating falling leaves on a forest floor as found in nature – the design principle, biomimicry, which means to mimic nature, was used in the design of the textile pattern itself. We find harmony and a greater sense of awareness when exposed to natural environments. Studies show that nature can accelerate the healing process mentally, physically and emotionally. Additionally, studies have proven that exposing patients to natural elements results in a calming effect, thereby reducing stress and allowing patients to focus on healing. By incorporating the concept of nature underfoot, the carpet strives to create a comfortable and soothing surrounding, while providing patients with acoustical privacy and a non-disruptive environment. From soothing colours of wildflowers to the unobtrusive patterns found on a wooded path, designs are created with nature and healing in mind. As another way in which to infiltrate the symbols of sacred geometry into the health centre , the overall carpet floor layout has been designed to do just this. 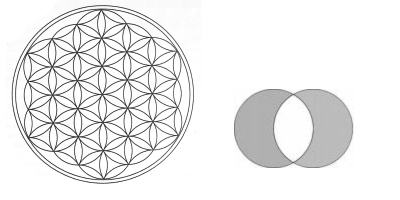 Specifically, in the waiting room there is a circle shape to reflect the vesica pisces, amplifying its significance, as, it is also literally a strong partition wall enclosing the waiting area. There are three tones of colour spaced around this circle inlay to symbolise the triple goddess symbol as three stages in a woman’s life: the Maiden, as birth (independent, self-centred, seeking), the Mother, as giving birth (interrelated, compassionate nurturing, creating), and the Crone, as death and renewal (holistic, remote, unknowable). The Triple Goddess Symbol is also used in the children’s play area and is is composed of waxing crescent, full moon, and waning crescent. At times, the crescents are tilted upwards to simulate the appearance of a young waxing moon above the horizon after just after sunset, and of an old waning moon above the horizon just before sunrise. The symbol is sometimes combined with a pentagram. The crescent consists of a 120° arc inscribed within a 180° arc (i.e. what is left over when a vesica pisces figure is inscribed within a circle). This shape is an approximation to the astronomically-correct crescent moon. In the Chinese waiting area of the health centre, we have incorporated some wave patterns with very significant and deliberate meanings and intentions. The ‘Wave Pattern’ used is based on one of the most popular Chinese and Japanese batik patterns. In China, water is said to possess eight qualities: it is clear, cool, healing, soothing, odourless, delicious, light, and soft. The subtle shapes of the watery ‘Wave Pattern’ can be very expressive, and invoking a calmness. As you walk out of the waiting area to the lower meditation room and various practitioner rooms there is also some discrete markings of a triangular nature. The triangle is perhaps the most easily recognised geometry. It holds the energetic intention for the meditation area. The triangular shape is created through the use of carpet design and angles in relationship to the walls. The triangle is a symbol for unity. Two always implies three. Triangles express relationship, strength, balance and energy, which make them a natural geometry to select for the meditation area. Biomimicry, which means to mimic nature, was used in the design of the textile pattern itself. The waiting room features light fittings inspired by orbs and spheres of light, which replicate the moon and planets. The precise positioning of each light, again encompasses the star tetrahedron geometry and the Fibonacci sequence of growth. The light fittings in the upper meditation platform are inspired by the white dove that was living and nesting in the rafters of the cathedral ceilings during construction. The precise positioning of each light, again encompasses the star tetrahedron geometry and the Fibonacci sequence of growth. We have dedicated a specific practitioner space for the practice of Traditional Chinese Medicine. Specifically designed rooms feature beautiful rosewood-style shelving, cabinets and special drawers which store Chinese medicinal herbs. The waiting area for the Chinese Medicine rooms is a self-enclosed glass atrium. This was added on as an extension to the passage way and captures the beautiful warming northern light. Waiting in this space will be a pleasure – warm and open with a gorgeous view to a Chinese-inspired garden to the outside and a light atrium garden inside. Other features include hand selected Chinese tiles and artworks. Waiting in this space will be a pleasure – warm and open with a gorgeous view to a Chinese-inspired garden. Because colours are important to healing, each colour used, from the walls, to the art and the carpeting have been consciously chosen for their healing properties. For example, we have selected violet and gold for the meditation area. The violet and gold will be most evident in the glass art windows so that the colour will transmit in the form of light into the space of the mediation platform.According to the spectrum of vibration, violet and gold are the shortest wavelength and highest vibration colours. They uplift and bring up the frequency of those who enter this field. The power of coloured light was well understood in ancient times. We have chosen violet because, though it is a very high vibration colour associated with the brow or third eye chakra of opening intuition, spiritual insight and vision, it also holds properties associated with release and purification as well. When one is relaxed and opened through massage, these beneficial states are enhanced through the use of the high vibrating frequency of purple in these areas. Healers often use colour in various ways (through crystals, light boxes, direct energy and sound transmission, etc.) to change the vibratory rate of different parts of the physical and etheric bodies. In this higher vibratory state, the physical body becomes more sensitive and receptive to the healing force which flows through the healer via the etheric and subtle bodies, with the intention of bringing back into harmony, parts that were vibrating out of alignment with the original etheric blueprint of health and well being. We have chosen an overall green-spectrum-based yellow colour for walls and a deeper green for the carpet, because it acts as a balancing tone, creating a feeling of calm, peaceful rest, which is conducive to healing. Green lies midway between red and violet in the colour spectrum and along with its complementary colour rose pink, is associated with the colours emitted by the heart chakra. Green is a master healing colour in so far as the most important element in healing is to bring whatever is necessary into balance and to assist in maintaining a calm, peaceful energy, attitude and frequency in the space. Blue is a colour which is often used for inducing a serene and calming feeling in the environment. Blue is associated with the throat chakra and is used to enhance communication and clarity. The reception area upper windows were specifically chosen to contain a beautiful blue based stained glass. The colour that is emitted by these is a real ultra blue tone. Each colour used, from the walls, to the art and the carpeting have been consciously chosen for their healing properties. The stone was sourced from Mt Gambier limestone quarries in South Australia but the creative journey of the sculpture evolved through the hands and heart of sculptor Geo Francis of Moongate Studios, Bellbrae Victoria. 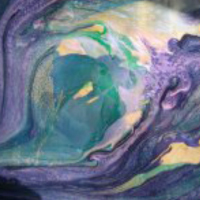 As work continued, an intuitive feminine energy manifested in the flowing sensual lines, both carrying the nautilus on its journey of reflection & healing and being pulled upwards by the tidal moon energy. The healing expression of labradorite courses down and out of the cavern to complete this eternal cycle. The strength and presence of the sculpture needed this feminine water energy to briefly transmute and crown into the eternal flame of engagement and inspiration, thus bringing a subtle balance and harmony to Moontide.